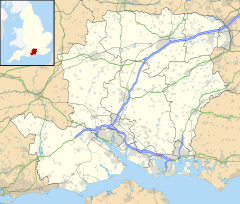 Exton is a small village and civil parish in the City of Winchester district of Hampshire, England. The village lies in the South Downs National Park, on the west bank of the River Meon, immediately to the north of Corhampton. It is located two miles north east of Droxford and five miles north east of Bishops Waltham. Its name first appears in 940 as East Seaxnatune, meaning "farmstead of the East Saxons". The parish straddles the Meon Valley, including higher ground of the South Downs to either side, with Old Winchester Hill to the east and the southern part of Beacon Hill (shared with Warnford parish) to the west. It is crossed from east to west by the present temporary route of the South Downs Way long distance footpath. The A32 and the Meon Valley Railway footpath cross from north to south. The parish contains numerous archaeological sites including a Mesolithic flint working site, Bronze Age bowl barrows and the Iron Age fort at Old Winchester Hill. There are also Roman and Dark Age sites and the site of the mediaeval village of Lomer. The 13th-century church of St. Peter and St. Paul was heavily restored in the 19th century. Exton has remained a small community for more than two centuries. In 1801 Exton's total population was 224, by 1901 it had grown slightly to 299 yet by 2001 the population had shrunk to 230 and again to 203 at the 2011 Census. Photographs from the 1950s show a village shop and post office in Exton but this closed in the 1960s. At the current time, the only community buildings in the village are the church and the Shoe Inn Public House. "EXTON, a village and a parish in Droxford district, Hants. The village stands 2 miles N by E of Droxford, and 5 NE of Bishops-Waltham r. station; and has a post office under Southampton. The parish comprises 2,464 acres (10 km²). Real property, £2,640. Pop., 257. Houses, 41. Exton Lodge is a principal residence. The living is a rectory in the diocese of Winchester. Value, 331. * Patron, the Bishop of Winchester. The church was rebuilt in 1847, and is in the early English style. " ^ "Parish Headcounts, Area: Exton CP". Neighbourhood Statistics. Office for National Statistics. 2001. Retrieved 2008-03-31. ^ a b "Civil Parish population 2011". Neighbourhood Statistics. Office for National Statistics. Retrieved 16 December 2016. ^ William Page, ed. (1908). "Parishes: Exton". A History of the County of Hampshire: Volume 3 pp 319-321. Victoria County History. Retrieved 2008-04-01. ^ "Exton". Hampshire Treasures Volume 1 Winchester City District p 105-112. Hampshire County Council. Archived from the original on 2005-03-09. Wikimedia Commons has media related to Exton, Hampshire. Electoral Wards and Parishes in the City of Winchester District, Hampshire, England (2016 boundary changes). This page was last edited on 12 November 2018, at 23:26 (UTC).